Excelsis Choir, Grayshott Concerts Choir-in-Residence, visited Belgium over the May Bank Holiday weekend. 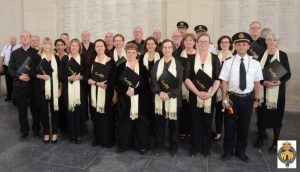 The tour was planned as part of the Choir’s tenth anniversary celebrations. The Choir was delighted to be accompanied by Grayshott Concerts founders Vivien and Peter Harrison, as well as our Musical Director Robert Lewis’ parents and Concert manager Steve Georgii. It was of course the Harrisons’ inspired vision to form a choir for the Grayshott Concert series. Their equally inspired invitation to Robert Lewis, then Music Director St Edmund’s School, Hindhead, to bring their vision to life in 2007 resulted in the choir’s now outstanding reputation. Ten years on, with the recording of Sir Karl Jenkins’ The Healer and many excellent performances to their credit, the Choir secured three engagements in Belgium during their tour. 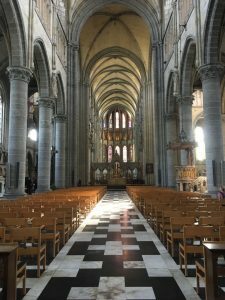 They were to sing Sunday Mass in Ypres Cathedral, with its highly challenging nine second echo, and an informal concert at Bruges Cathedral. 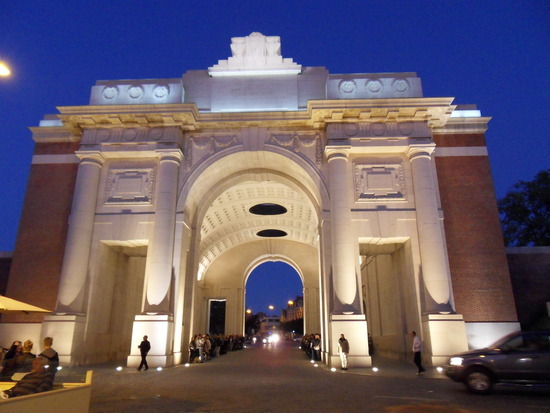 Their final engagement was to sing at the Last Post Ceremony at the Menin Gate. Rob Lewis had prepared the choir with some beautiful repertoire ranging from pieces by Gabrielli and Monteverdi to those by contemporary composers John Rutter, Paul Mealor and local composer Clive Osgood. The presence of the Great War is felt in the very fabric of Ypres. Its surrounding fields are scattered with cemeteries large and small (the smallest spotted was four gravestones). Ypres was a vital strategic landmark along the Front Line, which had to be held by The Allies to block the German Army’s progress towards French coastal ports. It is hard to believe that this pleasant, quiet, albeit somewhat solemn, town witnessed some of the most desperate fighting of the first Autumn of World War 1. Whilst The Allies prevailed and held Ypres, it was at great cost. Many thousands of lives were lost and Ypres’ ancient buildings were razed to rubble. The town, including the cathedral, was subsequently recreated in the 1920s and 1930s to resemble its former self. 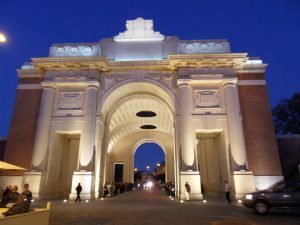 The Menin Gate memorial was erected in 1927 and famously bears inscriptions of the names of 54,389 officers and men from United Kingdom and Commonwealth Forces who fell in the Ypres Salient before 16th August 1917 with no known grave. 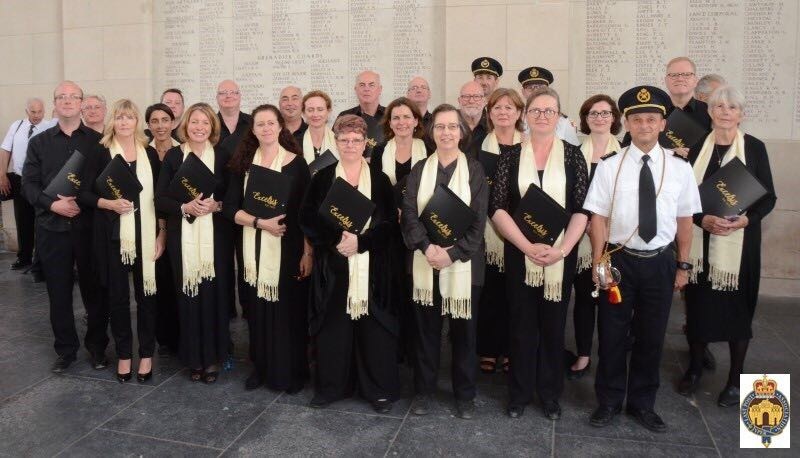 The emotional highlight of Excelsis’ tour was the engagement to sing at The Last Post Ceremony, held every night at 8.00pm under the vaulting arches of the Menin Gate. As the final note of the Last Post faded wreaths were laid to the memory of those who fell, whilst the Choir sang the beautiful and moving settings of Ubi Caritas by Gjeilo, and Locus Iste by Mealor. 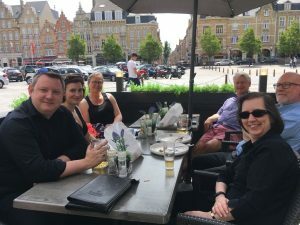 Away from the solemnity of the Menin Gate, the tour party had plenty of time for sightseeing and sampling the local beers and chocolate. 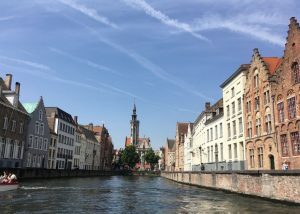 The highlight of our visit to Bruges was a boat trip through its beautiful canals and its stunning ancient buildings. Surprise entertainment on board was provided by a Barbershop Quartet! Choir members Richard Arthur, Steve Harman, Tim Dutton and Jess Harman had been secretly practising and treated us to superb renditions of some well known Songs of Yale. This entry was posted in In The Press on June 4, 2017 by Angela Hook.